I always want to make things at Christmas-time. Maybe it’s the connection to tradition; a century or two ago, people crafted humble gifts for one another: they knitted, embroidered, baked fruitcake and made preserves; they sewed, cobbled, quilted, whittled and wove. I’ve long since realized I’m a throwback from some previous generation, and so there is something about the spirit of the season that inspires me – no, requires me – to fashion things by hand. 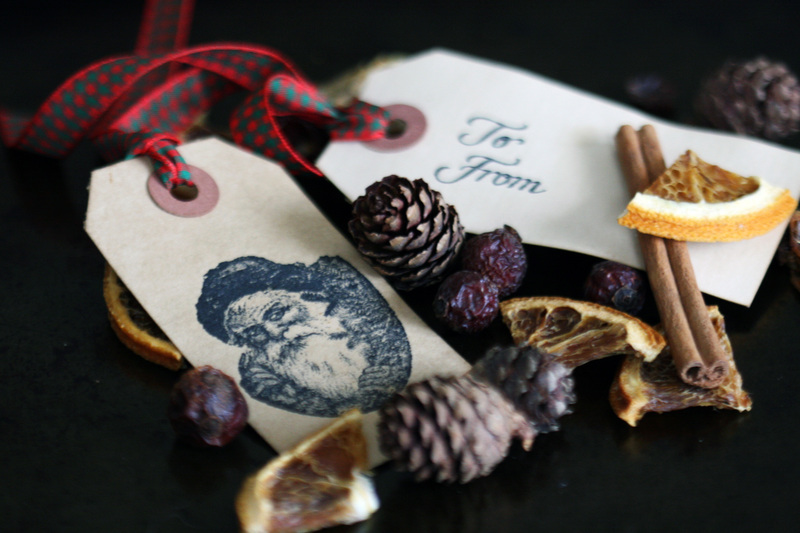 The best holiday decorating owes a lot to natural textures and accessories that appeal to all our senses: evergreen branches and pinecones, cinnamon and gingerbread, a healthy dose of tartan, and the clean, crisp scent of snow. Vintage-look gift tags are one of my favourite accessories to make, because they seem to capture all of these elements. They look beautiful whether tied to a wrapped gift, or hung on the Christmas tree. A variety of them, prettily packaged, can be a lovely and practical hostess gift. 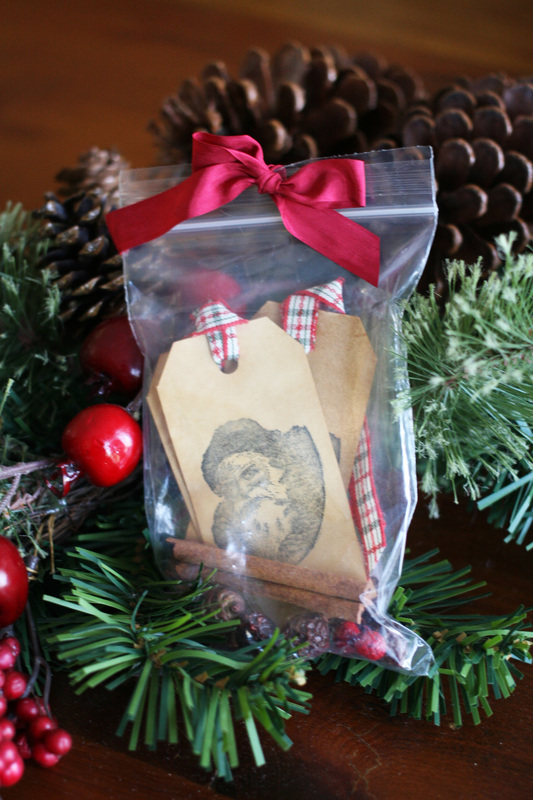 Scented gift tags are a cut above the rest, however, and today I’ll share my recipe with you. 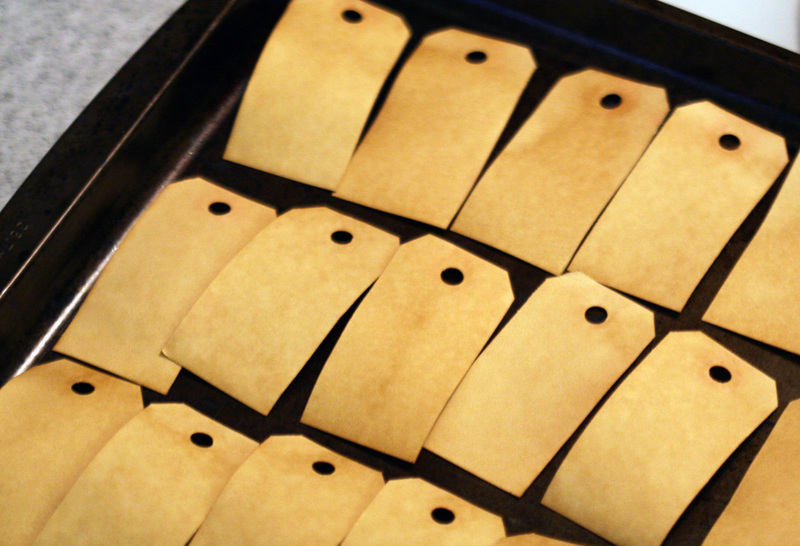 In fact, the process is more like following a recipe than you might expect, because you actually bake these tags in the oven! 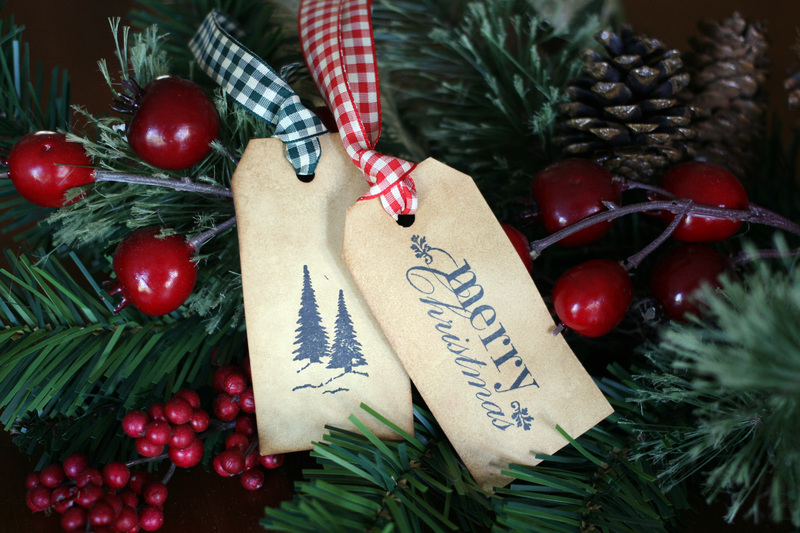 And like any other seasonal treat, these gift tags require a little extra planning and patience, but the effort is always rewarded by the result. They’re not labour-intensive, but you’ll need at least 10 days to properly complete the process. 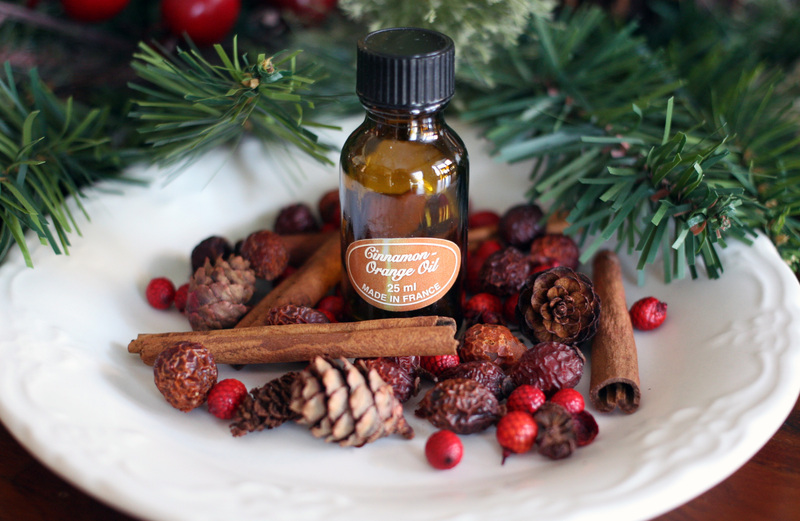 Natural Materials (Unscented): Rosehips, Cinnamon Sticks, Mini Pine Cones, Dried Orange Slices, etc. 1) The first step should be done 2 – 3 days before making the tags. Fill a large zip-lock bag half to three-quarters full of your natural materials. Sprinkle with scented oil, and shake. Keep sprinkling and shaking. 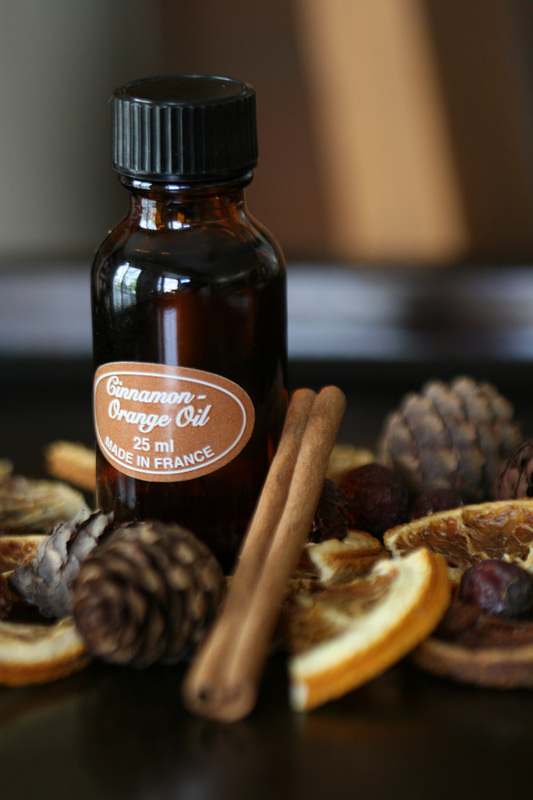 Don’t over-saturate, or the scent will be too over-powering, and the materials too oily. You should not use more than 5 – 6 splashes. Shake the contents well. Zip up the bag and let the natural materials absorb the oils for several days. 2) After your nature mix has “marinated” for a few days, it’s time to make the vintage-look tags. 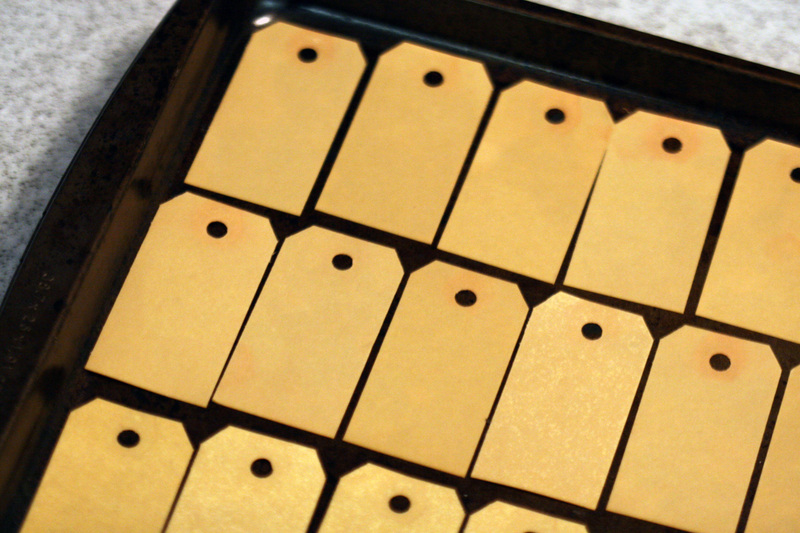 Start with basic manilla shipping tags from your local office supply store. They come in a variety of sizes. Pre-heat your oven to 250°F. 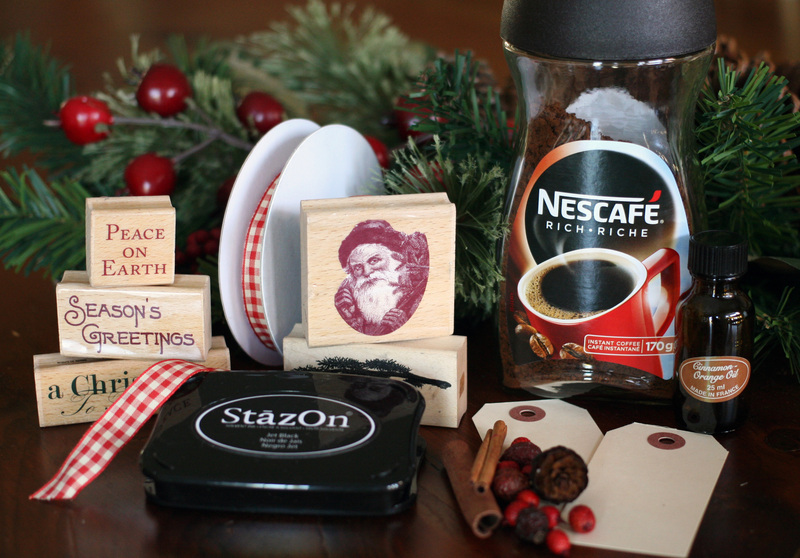 Pour boiling water into a large glass mixing bowl, and add 2 – 3 heaping tablespoons of instant coffee. Stir until dissolved. Add tags (10 – 12 at a time, depending on the size of your bowl) and let soak until fully saturated, usually 5 – 7 minutes. The longer they soak, the darker in colour they’ll be, so depending on your preference, you may want to leave them for 10 – 15. During this process, the brown paper reinforcement around the hole punch usually separates from the tag, which is fine because you don’t want that part, anyway. Bake in the oven for a VERY short period of time – 5 minutes or less – until they’re dry and curled at the edges. Don’t freak out because they’re no longer flat. They’re supposed to twist a bit and become imperfect; that’s what gives them a vintage effect. Now they have that authentically aged appearance. They are as beautiful plain as they are decorated, and if you want to leave them just like this, I don’t blame you one bit, and you should just go ahead and do that. 4) Remember that ziplock bag full of scented nature goodness? 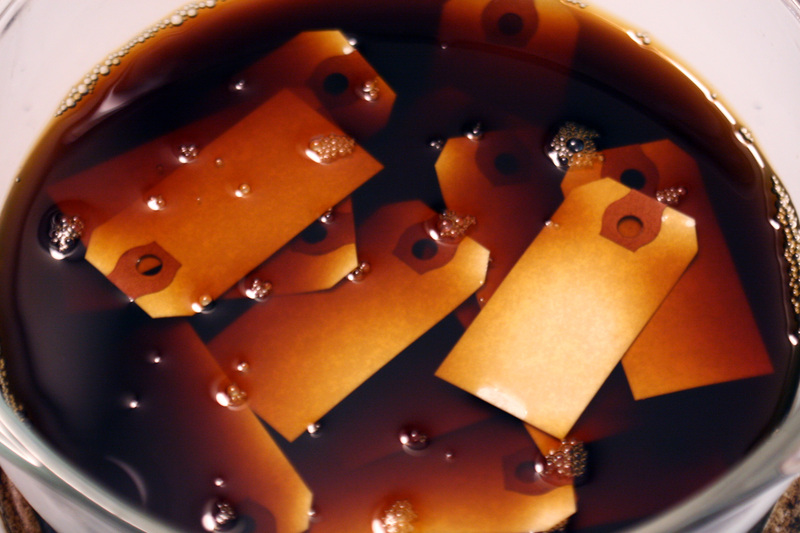 Once all your tags are baked and dry, add them to the bag of mix and zip it back up, sealing all the good smells inside. (Don’t over-stuff the bag with tags; split the mix into a second bag if you have to.) 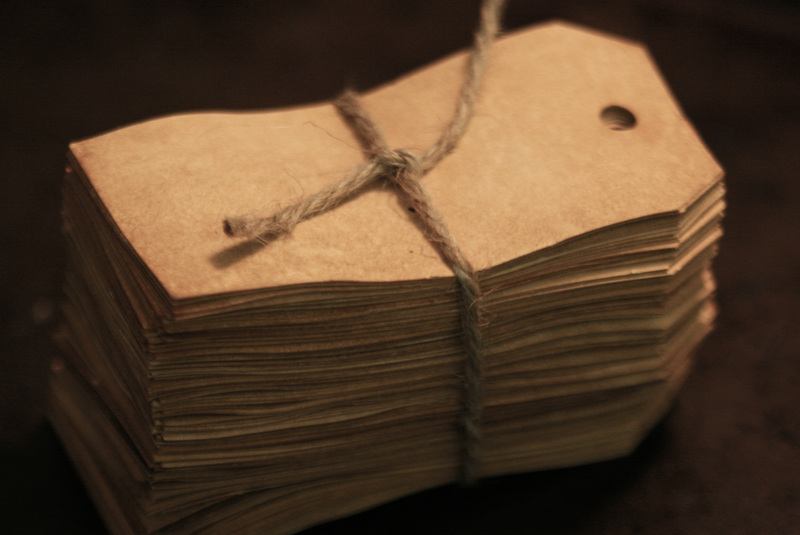 Shake the contents, ensuring that the tags are well distributed amongst the natural materials. Keep the tags sealed in the bags for at least one week. 5) After 7 – 10 days have passed, remove the tags from the scented nature mix. You’ll find that the paper fibers have absorbed the scent, and it is good. Now, you can start adding stamped images (if you want.) I like to use classic images and expressions to enhance the “antique” design style. My favourite ink is Staz-On. It’s available at Michaels, and they’re not even paying me to say that. Shameless plug or awesome crafting tip? Maybe both. You decide. 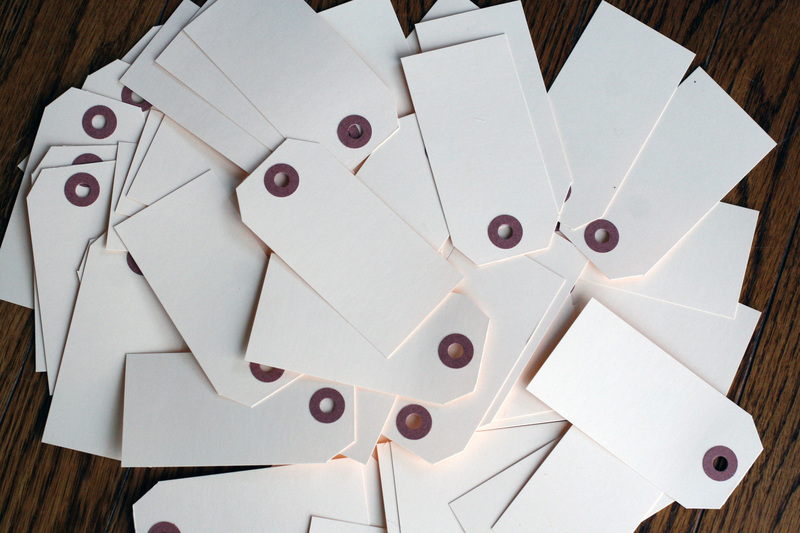 6) Once stamped, choose your ribbon and thread the tags. 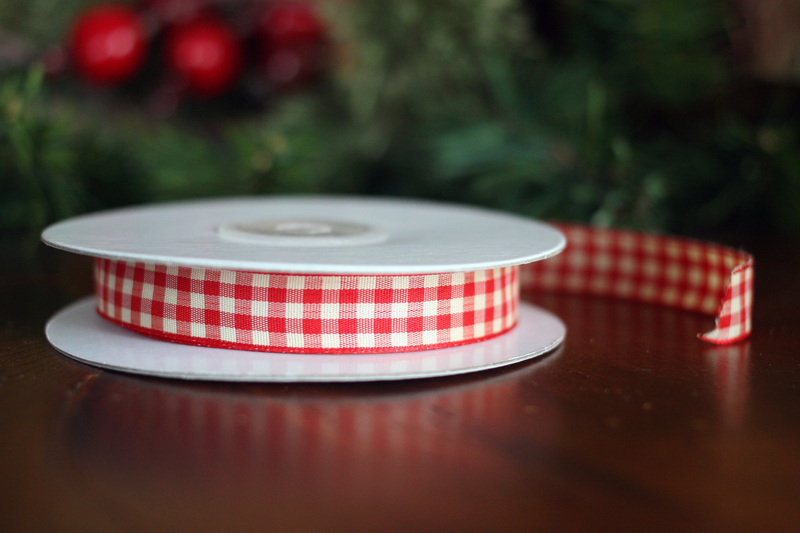 I personally have a weakness for anything gingham, tartan or plaid during the holidays. 7) The best way to retain the scent is to package them with a bit of the nature mix. Seal them in a plastic envelope in groups of three or six, and tie with a satin bow. 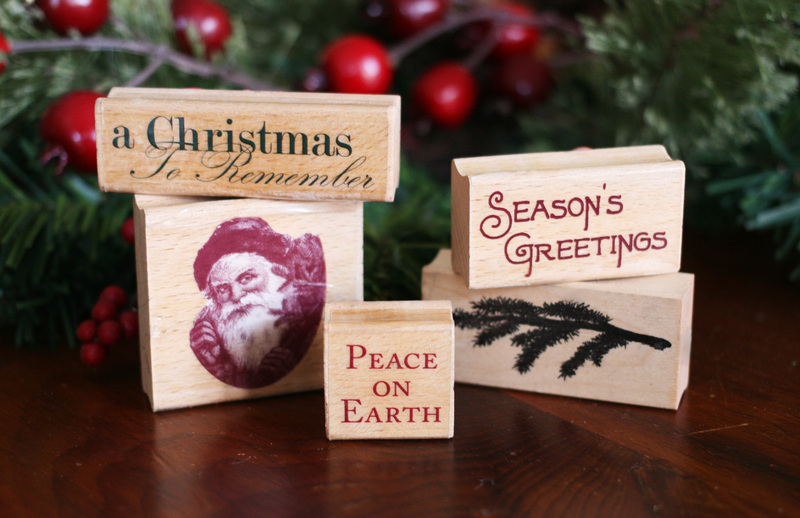 They make a lovely and practical gift for teachers, neighbours, co-workers, or anyone else you can think of. I hope you’ve enjoyed this tutorial and that you have been inspired to make your own handcrafted holiday accessories this year. Happy crafting!